You can really see spring's arrival unfold across North America thanks to the reports from Journey North citizen scientists. You can really see spring’s arrival unfold across North America thanks to the reports from Journey North citizen scientists. Some of our Journey North volunteers rise very early in the morning to capture the song of Robins as they arrive in spring. 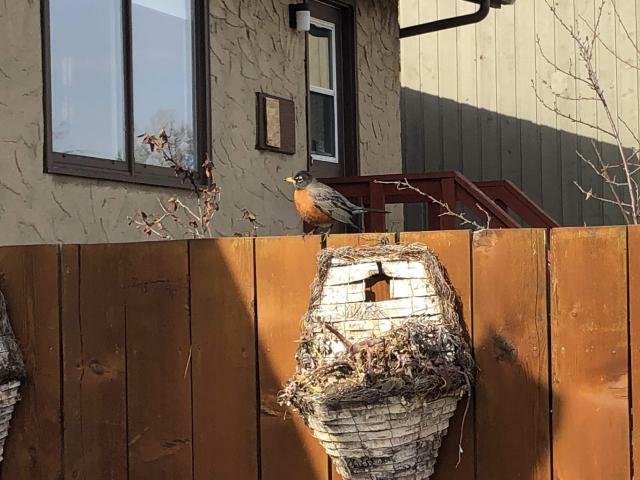 Even though snow remains on the ground, American Robins are arriving and singing in more northern places, including Juneau and Anchorage, Alaska. Indeed, just in a period of four days, Journey North volunteers documented the arrival of Robins in four Canadian provinces: Ontario, Alberta, Saskatchewan, and Nova Scotia. As the ground thaws in the southern United States, Journey North volunteers are observing that robins are shifting their food preference from berries to worms . If your robins are singing, look for signs of nest building. Both males and females gather materials but usually only the female builds the nest. When the first females arrive, you’ll notice their plummage appears faded and drab in comparison to the male plumage. Let us know if you see a robin with a beakful of dried grasses or mud on her breast feathers. 5:27 AM Robins Came Alive!